SpiceJet announced attractive Diwali gifts as offers to the persons those who wants to travel through flight within Indian and outside India. 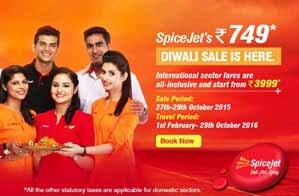 Diwali Sale of SpiceJet tickets start from Rs.749/- and International sector fares are all - inclusive and start from Rs.3999/-. The Sale of the tickets period is from 27th October 2015 to 29th October 2015. Travel period will start from 1st February 2016 and end to 29th October 2016. 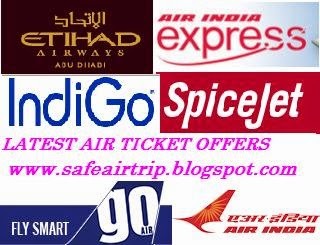 So make the travel plan early, utilize the Offer and start to Book the tickets Now. SpiceJet also increase Flight frequency. Increased frequency from Mumbai to Chennai, Ahmedabad, Goa, Kochi and Hyderabad. And another offer is those who download the Spice Jet app will get additional discounts. Yes , of course SpiceJet is Red, Hot and Spicy.